Astronomers have found an enormous, glowing blob of gas in the distant universe, with no obvious source of power for the light it is emitting. Called an "enormous Lyman-alpha nebula" (ELAN), it is the brightest and among the largest of these rare objects, only a handful of which have been observed. ELANs are huge blobs of gas surrounding and extending between galaxies in the intergalactic medium. They are thought to be parts of the network of filaments connecting galaxies in a vast cosmic web. Previously discovered ELANs are likely illuminated by the intense radiation from quasars, but it's not clear what is causing the hydrogen gas in the newly discovered nebula to emit Lyman-alpha radiation (a characteristic wavelength of light absorbed and emitted by hydrogen atoms). The newly discovered nebula was found at a distance of 10 billion light years in the middle of a region with an extraordinary concentration of galaxies. Researchers found this massive overdensity of early galaxies, called a "protocluster," through a novel survey project led by Zheng Cai, a Hubble Postdoctoral Fellow at UC Santa Cruz. MAMMOTH-1 is an extended blob of gas in the intergalactic medium called an enormous Lyman-alpha nebula (ELAN). The color map and contours denote the surface brightness of the nebula, and the red arrows show its estimated spatial extent. "Our survey was not trying to find nebulae. We're looking for the most overdense environments in the early universe, the big cities where there are lots of galaxies," said Cai. "We found this enormous nebula in the middle of the protocluster, near the peak density." Cai is first author of a paper on the discovery accepted for publication in the Astrophysical Journal and available online at arxiv.org/abs/1609.04021. His survey project is called Mapping the Most Massive Overdensities Through Hydrogen (MAMMOTH), and the newly discovered ELAN is known as MAMMOTH-1. Coauthor J. Xavier Prochaska, professor of astronomy and astrophysics at UC Santa Cruz, said previously discovered ELANs have been detected in quasar surveys. In those cases, the intense radiation from a quasar illuminated hydrogen gas in the nebula, causing it to emit Lyman-alpha radiation. Prochaska's team discovered the first ELAN, dubbed the "Slug Nebula," in 2014. MAMMOTH-1 is the first one not associated with a visible quasar, he said. "It's extremely bright, and it's probably larger than the Slug Nebula, but there's nothing else visible except the faint smudge of a galaxy. So it's a terrifically energetic phenomenon without an obvious power source," Prochaska said. Equally impressive is the enormous protocluster in which it resides, he said. Protoclusters are the precursors to galaxy clusters, which consist of hundreds to thousands of galaxies bound together by gravity. Because protoclusters are spread out over a much larger area of the sky, they are much harder to find than galaxy clusters. The protocluster hosting the MAMMOTH-1 nebula is massive, with an unusually high concentration of galaxies in an area about 50 million light years across. Because it is so far away (10 billion light years), astronomers are in effect looking back in time to see the protocluster as it was 10 billion years ago, or about 3 billion years after the big bang, during the peak epoch of galaxy formation. After evolving for 10 billion more years, this protocluster would today be a mature galaxy cluster perhaps only one million light years across, having collapsed down to a much smaller area, Prochaska said. The standard cosmological model of structure formation in the universe predicts that galaxies are embedded in a cosmic web of matter, most of which is invisible dark matter. The gas that collapses to form galaxies and stars traces the distribution of dark matter and extends beyond the galaxies along the filaments of the cosmic web. 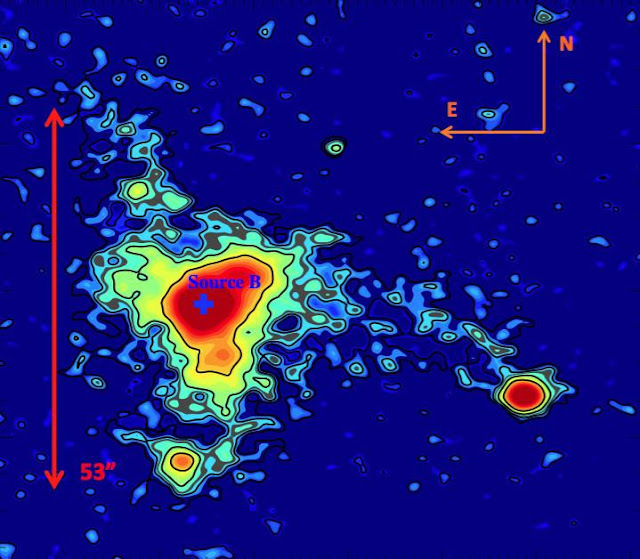 The MAMMOTH-1 nebula appears to have a filamentary structure that aligns with the galaxy distribution in the large-scale structure of the protocluster, supporting the idea that ELANs are illuminated segments of the cosmic web, Cai said. "From the distribution of galaxies we can infer where the filaments of the cosmic web are, and the nebula is perfectly aligned with that structure," he said. Cai and his coauthors considered several possible mechanisms that could be powering the Lyman-alpha emission from the nebula. The most likely explanations involve radiation or outflows from an active galactic nucleus (AGN) that is strongly obscured by dust so that only a faint source can be seen associated with the nebula. An AGN is powered by a supermassive black hole actively feeding on gas in the center of a galaxy, and it is usually an extremely bright source of light (quasars being the most luminous AGNs in visible light). The intense radiation from an AGN can ionize the gas around it (called photoionization), and this may be one mechanism at work in MAMMOTH-1. When ionized hydrogen in the nebula recombines it would emit Lyman-alpha radiation. Another possible mechanism powering the Lyman-alpha emissions is shock heating by a powerful outflow of gas from the AGN. The researchers described several lines of evidence supporting the existence of a hidden AGN energizing the nebula, including the dynamics of the gas and emissions from other elements besides hydrogen, notably helium and carbon. "It has all the hallmarks of an AGN, but we don't see anything in our optical images. I expect there's a quasar that is so obscured by dust that most of its light is hidden," Prochaska said.